This time it's for my 2017 Contest Submission, so hopefully that won't turn too many of you off to giving me a hand. Because this is for a competition, I've been holding out on asking for help; but screw it, there's around 24 hours left and I'm pretty much stuck. Right now, I'm working on my hammer action, clip fed blaster, and I'm having issues making the mechanism for cycling the clip. 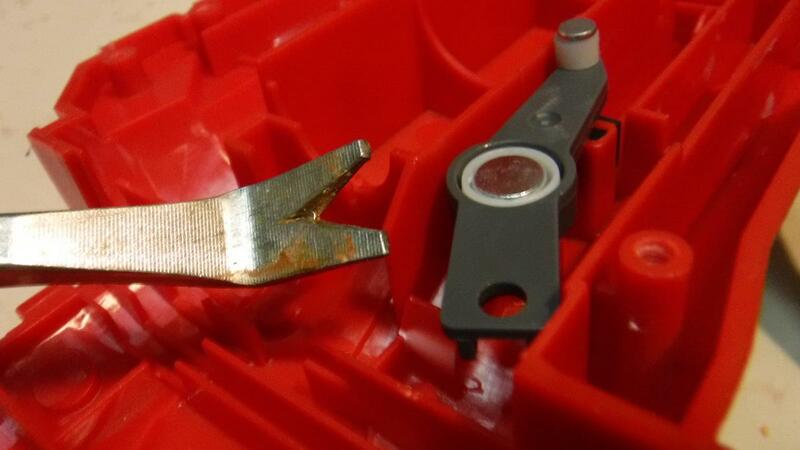 The idea is that a [poorly placed] tab on the hammer will push a piece forward, moving the clip slider (standard Boomco piece, black) thing down. Ideally, there will be some springs to help make this more fluid, but that's a problem for later. So the problem I've been encountering is that the "clip slider" comes out of alignment (I will put in rails for it later) when placed under pressure and messes the whole thing up. I've tinkered with the homemade plastic pieces without the Boomco slider in place and it works just fine, so this is the only known issue right now. I think I need to change the shape of the front of the plastic (I've already tried one other shape), but I don't know what to change it to. Another solution could be to shave off the circular nub and put a triangular nub in its place, but that is too risky/permanent, and I'm not that desperate yet. I know this mechanism might not be the most efficient way to do this, but I've already invested too much time into it for now. I would be very grateful if someone were to help me out here. If this works, I'll be able to put up a tutorial write up within the next 24 hours with some more juicy pictures. Edited by An unnamed cell, 30 August 2017 - 08:19 PM. So the white piece that pushes directly on the black peg is moving out of place rather than pushing the peg downward/advancing the clip? I would say that first of all you definitely need rails of some sort to keep that from happening. It looks like you have a guide below the armature (right in front of the trigger guard) but nothing above it which is the direction that the peg will be trying to force it. Also it could be that the angle of the ramp on the pusher is too steep. It may need to be closer to horizontal. 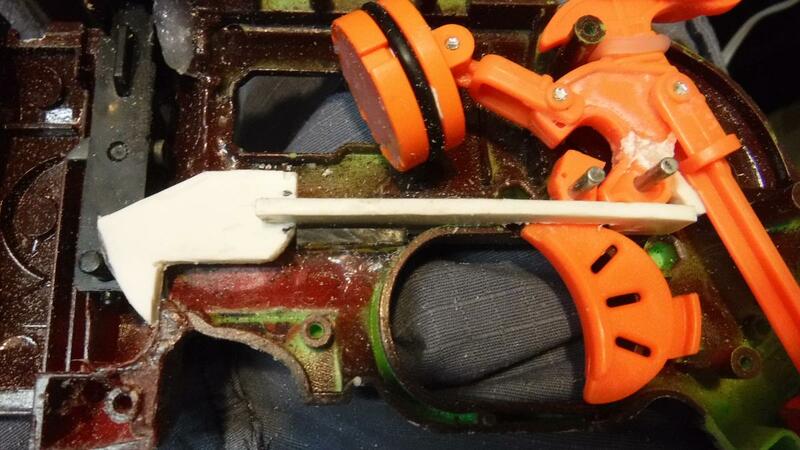 What blaster did you steal the clip mechanism from? It looks like you have a guide below the armature (right in front of the trigger guard) but nothing above it which is the direction that the peg will be trying to force it. There is a rail above the white piece, it's just very short. However, it gets the job done. 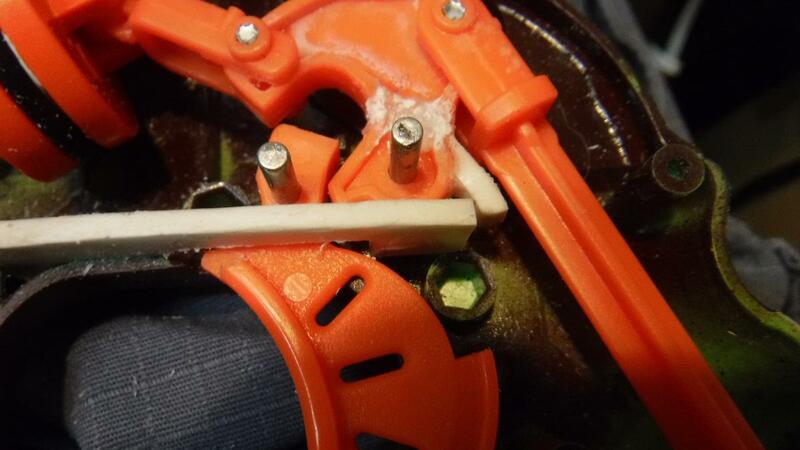 As I said, the problem is in the black piece that operates the clip. This blaster is an integration of the Boomco Crankforce and Doublstrike. I tried using the mechanism from the Crankforce, but it didn't make much sense to continue using it (see other thread for internals). 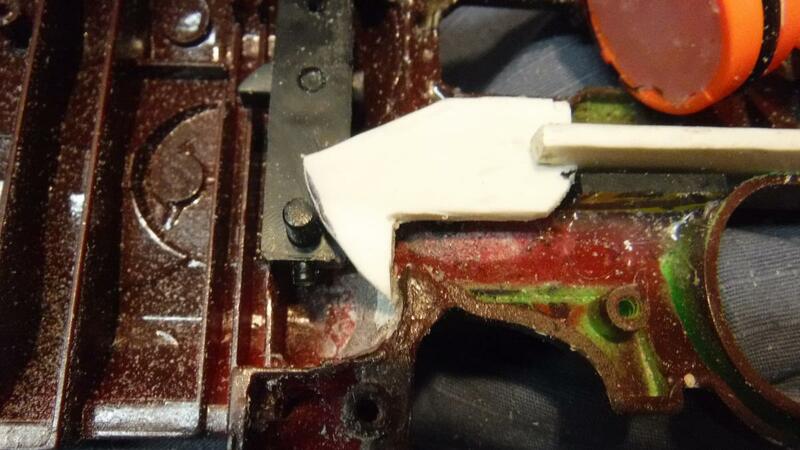 The black piece is pushed down from a lever that is mounted to the gun, which was hard to replicate with epoxy putty and limited shell space. EDIT: the mechanism is covered by the piece that operates it. Here is a picture of it in its natural habitat right before I surgically removed it. The troublesome black piece has a circular nub which fits inside the hole. Edited by An unnamed cell, 30 August 2017 - 09:00 PM.